MSU College Transition Eased with M.A.G.I.C. 2015 MAGIC student participants. Photo courtesy of OCAT. This year, the Maximizing Academic Growth In College (MAGIC) program from the Office of Cultural and Academic Transitions (OCAT) will celebrate its 20-year anniversary. MAGIC is a weeklong program for admitted and incoming MSU students who have already participated in Academic Orientation Program (AOP). MAGIC participants engage in academic workshops and activities to prepare them for college life at MSU. The founder of MAGIC, Murray Edwards, interim director of OCAT, wrote a proposal for the program 22 years ago. Edwards said that he believed there was room for improvement with AOP. 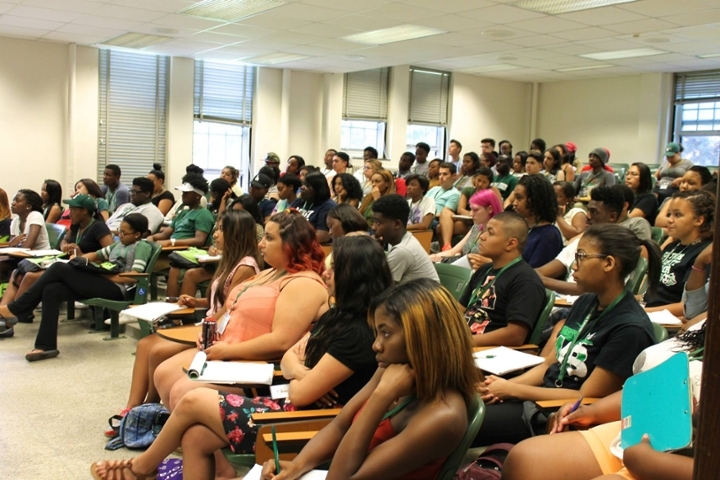 2015 MAGIC student participants during an academic training session. Photo courtesy of OCAT. MAGIC has three main goals, Edwards said: To expose students to college success strategies; to expose students to valuable campus resources; and to reduce the level of a student’s anxieties about college. “Basically, the whole idea was to provide sessions and exposure to those students and to answer any questions an incoming college students may have, in terms of things they need to know about and make the transition into college,” explained Edwards. MAGIC students also get a chance to meet other students and have a network of students they know when they come to MSU in the fall. They will also prepare for MSU classes and experiences through several academic sessions covering writing, mathematics, time management, and study skills. There are two MAGIC sessions in July, each lasting a week and involving 200 incoming MSU freshmen. For more information on MAGIC, please visit the OCAT website.